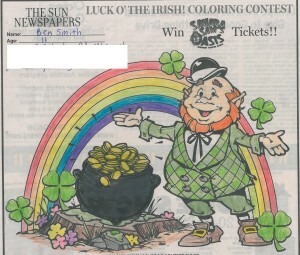 The Sun is proud to announce its winners for the St. Patty’s Day Coloring Contest. 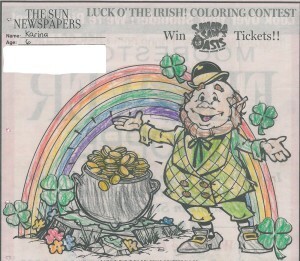 Run in all 10 of our newspapers, children from around South Jersey and Princeton colored the leprechaun and his pot of gold at the end of the rainbow and sent their creation in to us. In total, we received 99 entries in only one week! Winners of the contest received a four-pack of tickets to Sahara Sam’s! The winners for Mt. Laurel are below. 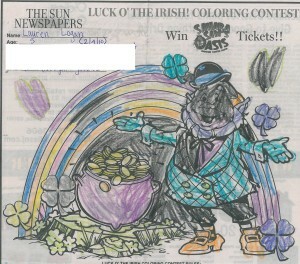 All three winning entries are below. They can also be viewed on our Facebook page, www.facebook.com/mtlaurelsun.